According to a new market report published by Transparency Market Research “Home Audio Equipment (Product Types - Home Theatre in-a-box, Home audio systems, Home radios, Other home audio accessories) Market - Global Industry Analysis, Size, Share, Growth, Trends and Forecast, 2013 - 2019,” the market was valued at USD 15.94 billion in 2012 and is expected to reach USD 20.68 billion by 2019, growing at a CAGR of 3.7% from 2013 to 2019. Europe was the largest contributor to global home audio equipment market in 2012. 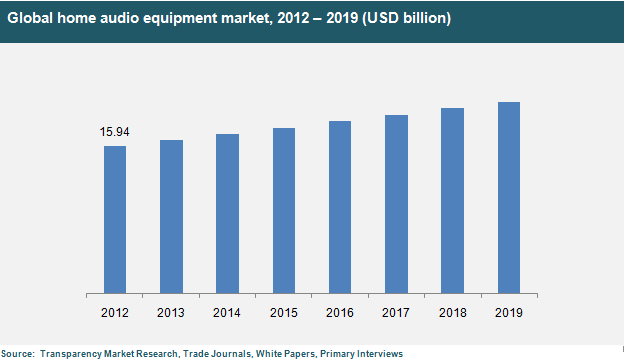 Asia Pacific region is expected to be the fastest growing market for home audio equipment during the forecast period with a CAGR of 5.7% from 2013 to 2019. The rapid growth of electronic industry in Asia Pacific region, particularly in countries like China, Japan, Korea, and India is driving the growth of Asia Pacific in home audio equipment market. Advancement in audio technologies and development of advanced home entertainment products has increased the usage of home audio systems. Increase in disposable income has led to change in media consumption habits. People prefer to buy technologically advanced entertainment products such as computers, televisions, video game and smartphones among others. There is increasing adoption of medium sized and large sized plasma, LCD and LED TVs. With increasing adoption of televisions and computers, space-efficient audio equipment that provides distinctive and powerful surround sound audio is increasingly used by consumers. In 2012, other home audio accessories segment which includes speakers, subwoofers, amplifiers, microphones, and others held the largest share of 31.5% of the total home audio equipment market. This dominance is due to the increasing usage of mobile devices. The demand for premium audio equipment accessories is also expected to increase during the forecast period. Europe led the global home audio equipment market in 2012 followed by North America. This is mainly due to the increasing adoption of technologically advanced entertainment products in the regions as consumers in Europe are early adopters of new technologies such as Blu-ray players, smartphones and TVs. The global home audio equipment market is highly fragmented and competitive. Major industry participants include Akai, Dolby Laboratories Inc., DTS Inc., JVC KENWOOD Holdings Inc., Koninklijke Philips Electronics NV, LG Electronics, Panasonic Corporation, Sanyo Electric Co. Ltd., Nakamichi Corporation, Onkyo Corporation, Pioneer Corporation, Sharp Corp., Sony Corporation.